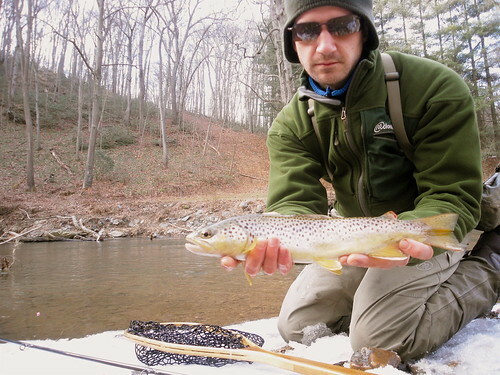 Thanks to Daniel for the fishing report and kind words from his trip to the Gunpowder this past Saturday. I just wanted to thank you for mapping out some of the local river crossings for me earlier today. I had an awesome time out there! It was my first trip on the Gunpowder and I must say I’m in love already. It was cold and the fishing was tough. I had to dip my tip often because of ice. I managed to fool a small brown into striking a brown bugger below a log jam, just as you suggested. Its been years since I’ve caught a brownie so it made my day. I spent the last 10 years in Texas fishing the Guadalupe, which TU stocks with Bows only. Guadalupe Bass, and Smallies are a much more typical catch throughout most of that river. It felt wonderful to fish for cold water species in their natural setting. You guys are truly blessed with a beautiful fishery. I will frequent your website, and have already become a huge fan of your writing and videography. I feel excited to be back home in Maryland, Texas stocked trout cannot compare to matching wits with a wild specimen. I hope to learn much about the area in the future and plan to fish the river as much as possible between now and May, when I will head to Alaska for my summer job. You guys run a great shop and I look forward to stopping in again soon. Thank you for pointing me in the right direction, it was by far the most informative first trip to a fly shop Ive ever had. This entry was posted in fishing report on January 31, 2010 by Theaux Le Gardeur. The Gunpowder river is flowing at 155 Cfs, is clear and river water temps are still below 40 F. The wind and cold this week has made for challenging fishing. Stoneflies are about but not many fish are willingly to commit to dries. We were paid a visit midweek by a hardy Nebraskan angler from the Cornhusker Fly-Fishers . They have a CCF CARPFEST listed on the site that looks interesting-any takers? Gunpowder regular Carl also stopped in this week with some old paper goods- a 1976 Leonard Spring Catalog and a 1969 issue of TU’s Trout magazine with a dead ringer for Curt Gowdy on the cover. What a treat! He also brought in his time machine for my inspection. It is a 6 1/2 ft 3wt Leonard with red wraps that he picked up used in the mid-80’s for around $200 bucks. Once it warmed up in the shop, we put it together and I have to tell you, all of a sudden, except for the absence of green bodied caddis, it felt like spring. He also had a Hardy Featherweight and a yellowed receipt that showed that the English made reel cost him about $65.00, (new) back then. If you have the gear and are getting a little stir-crazy around the house, large streamers, small Copper Johns #18-20 and Prince nymphs #14-16 are worth a shot. Because we still have a good bit of spillover, the lower river is still warmer than the upper so try any access downstream of York Rd. The fishing can be tough this time of year but you’ll likely remember a day afield better than anything on TV. How many Snuggie or Bumpit commercials can your mind take? The secret to fishing comfortably during the winter is to limit one’s wading, stay hydrated and catch a few fish-they always have a decided warming effect that is not quantifiable. For those still on the fence about trying your luck on the river, we still have room in tomorrow’s Stonefly Lifecycle Class. Give us a call at 410-357-9557 if you’d like us to reserve a spot for you around the tying table. Who knows, it might be warm enough to wet a line after class lets out at noon. This entry was posted in fishing report on January 29, 2010 by Theaux Le Gardeur. Nymph Patterns: Dredging bottom anyone? Soft Hackle Patterns: Classic, simple and easy to fish. Emerger and Cripple Patterns: Picky fish beware! Parachute Patterns: Learn tricks that make tiny flies visible again! Midge Lifecycle: Challenging patterns that work! Mayfly Lifecycle #2 Sulphurs-enough said. Stonefly Lifecycle: Deadly Winter patterns for hardy souls. All classes are limited to six students per instructor, are $45 and must be prepaid. Please check the “EVENTS” sidebar for scheduled dates. If you’re thinking about trying tying this Winter consider picking up a gift certificate and call us at 410-357-9557 to reserve your spot at the tying table. This entry was posted in news on January 29, 2010 by Theaux Le Gardeur. Here is a quick update from our trout in the Classroom schools. –all of the eggs have hatched and the alevins are hanging on. Soon they’ll be swimming around in the wide world of a 55 gallon tank. 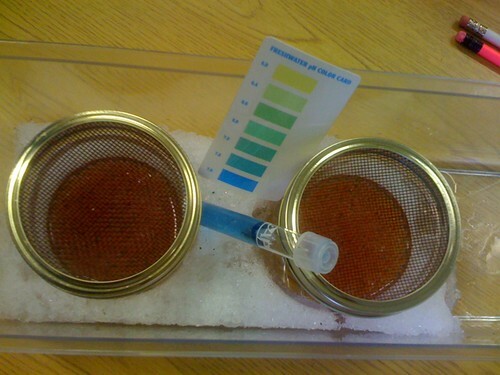 Checking tank pH and water temperature were the first orders of business upon delivery of the fertilized trout eggs. 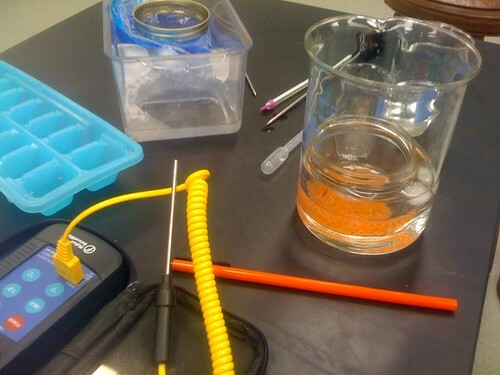 Be sure to check out the Lutherville ilab blog for a first hand look at how the trout are developing. Fly Fishing Maryland? Please join us for an Intermediate Fly Tying Class on Saturday, February 7, 2010 from 9:00 AM till 12:00 PM. The class focuses on Cripple and Emerger Patterns. Our very own Gunpowder river guides will be teaching this challenging advanced class. Cost of the class is $45 per person, and includes the use of materials. Please bring your own tools.The class is limited to six and pre-payment is required. Please give us a call at 410-329-6821 or drop us a line at info@backwaterangler.com to register. Fly Fishing Maryland? 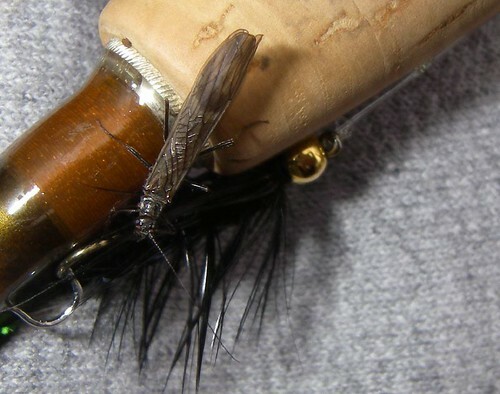 Please join us for a Beginner’s Fly Tying Class on Saturday, February 6, 2010 from 9:00 AM till 12:00 PM. The class focuses on Gunpowder River Favorites. Our very own Gunpowder river guides will be teaching this fun-filled beginner’s class. Cost of the class is $45 per person, and includes the use of materials. Please bring your own tools.The class is limited to six and pre-payment is required. Please give us a call at 410-329-6821 or drop us a line at info@backwaterangler.com to register. This week the brutal cold spell finally lifted in Northern Baltimore County, and air temps hit the mid 40s toward the end of the week through the weekend. The water temps are still really cold, (37-39 degrees) with the majority of air temp influenced flow spilling over Prettyboy dam. We have been fielding a lot of calls and questions in the shop about where the water is warmest, and here is what I found. At Noon on Friday water temps on the Gunpowder at Falls Road measured 37.8 degrees, 38.3 degrees at Bluemount Road, and Little Falls was 38.1 degrees. On Saturday, on a guide trip the water spiked from 38.6 to 40.6 degrees midday at York Road, when air temps climbed to 46 degrees. The fishing has been challenging, but a few hours on the water usually equals a few fish on the line. Tandem nymph rigs or flashy streamers are working the best for the customers passing through the shop. On Friday, after checking temps I decided to fish an area I haven’t tried since the Summer. While nymphing a deep hole I lost a hard fighting fish on a nymph rig, shaking me loose before I had a chance to see the fish. A short distance upriver I came tight again to a good sized trout, but got this one into the net. The brown above measured 15 inches and was caught outside the catch and release section of the Gunpowder. I filmed some other fish and the first stonefly of the year in the first video post of 2010. Aside from fishing and a little video work, I was breaking in a new pair of the Simms Vibram soled Headwaters boots, as shown in the pic above. 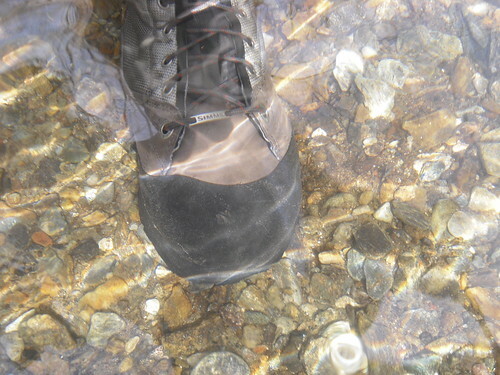 This is the lightest, bare-bones, Simms boot and they work great on muddy banks, rock slabs, ice and snow. The clean gravel in the photo above and lack of Didymo is a welcome relief for anglers fishing the Gunpowder, since the past two Winters the algae thrived in the low flows. The high water through the Fall of 09 and the continuous precipitation and spillover this Winter has helped thwart this nuisance from taking hold again. At least for now anyway. Unfortunately, as some may already know, it was announced a month ago that Didymo was discovered in the Savage River in Western Maryland. There is a wealth of information available on how to contain and kill these invasives, but not much on the effects they will have on our fisheries in the years to come. This entry was posted in fishing report, video on January 18, 2010 by Jason du Pont. The Gunpowder is flowing at 106 Cfs is clear, and is dangerously close to 38 F at Falls Rd. Slightly warmer water can be found a little further downstream as we still have a lot of spillover that’s keeping the upper sections cool. Large streamers dead drifted under indicators and stonefly nymphs fished through the shallow gravel are good bets. If conditions stay this warm, stoneflies should be buzzing soon. Black flies are also on the way and can be imitated with a number of midge patterns that have just arrived-just be sure to use plenty of 7x. We’ve had more than a few people falling in the water this week-5 at last count, so be sure to take your time out there and pack a full change of clothes just in case. The river, and the fish are waiting. I just returned from fishing the Gunpowder at the put in on Bunker Hill Road. The fishing wasn’t bad, if a little cold… I didn’t get on the water until 4:00 pm, but caught a couple of browns almost right away. I missed a couple as well, including one long distance release after a hook-up. All of the bites and fish were on an articulated leech of about 2″ in length with a barbell head. I had the same luck yesterday, catching two and missing several. All 4 fish were caught above the unfinished bridge. 3 of the 4 struck hard on the fly, while one, a little 6″, sort of inhaled it and kept swimming. It was FREEZING, but the Patagonia gloves performed excellently. This entry was posted in fishing report on January 15, 2010 by Theaux Le Gardeur.